A pair of porcelain bottle vases of double-gourd shape with long necks. The vases are decorated in underglaze cobalt with a twisted pattern and reserved foliate cartouches containing birds on branches to the lower bulb. The upper bulb is similarly decorated but here the cartouches are circular and contain scenes of men on horseback and pavilions underneath trees. A band of key-fret pattern separates the lower bulb from the upper bulb and the necks are painted with different diaper patterns. The top rims are covered in a brown wash. The bases are unglazed. The vases are contained within an old wood tomobako that has paper labels pasted to the sides. The label on the side is inscribed in black ink: Kutani Seika-saku, shonzui utsushi, tokkuri futatsu (blue and white shonzui style porcelain (Chinese blue and white porcelain Xiangrui style), a pair of saké bottles, made by Seika, Kutani ware). 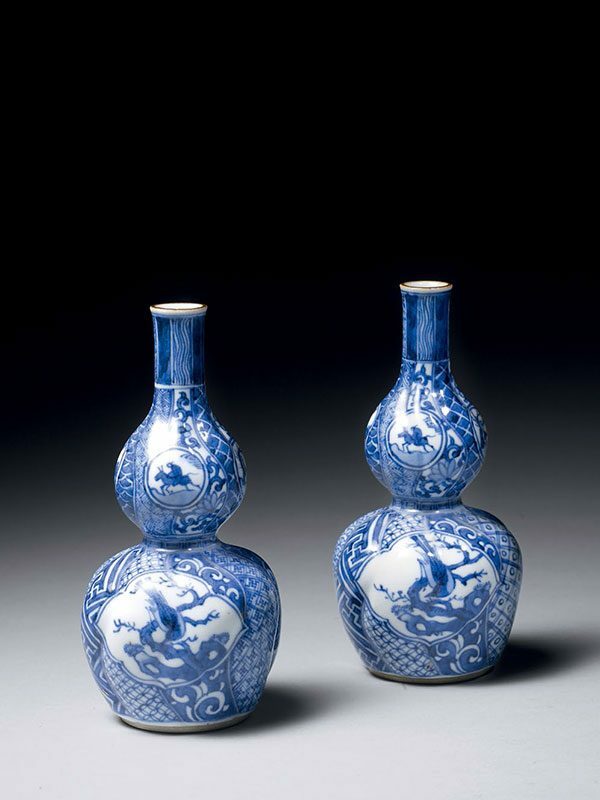 Both in shape and in underglaze blue decoration these bottles imitate Chinese porcelain. Porcelain production began in Japan in the early 17th century, several hundred years after it had first been made in China. By the mid-17th century Chinese porcelain production, which had dominated the international market up to that point, went into decline due to social unrest and accompanying dynastic change. There was therefore a demand for porcelain in the international market shortly after the industry had begun to develop in Japan. There are four generations who operated the Suda Seika Kiln: Seika I (1862-1927), Seika II (1892 – 1971), Seika III (1916 – 1981) and Seika IV (born in 1940); the current generation master, who succeeded in 1981.